I have been eager to get back out in the snow since returning from vacation in Kauai. 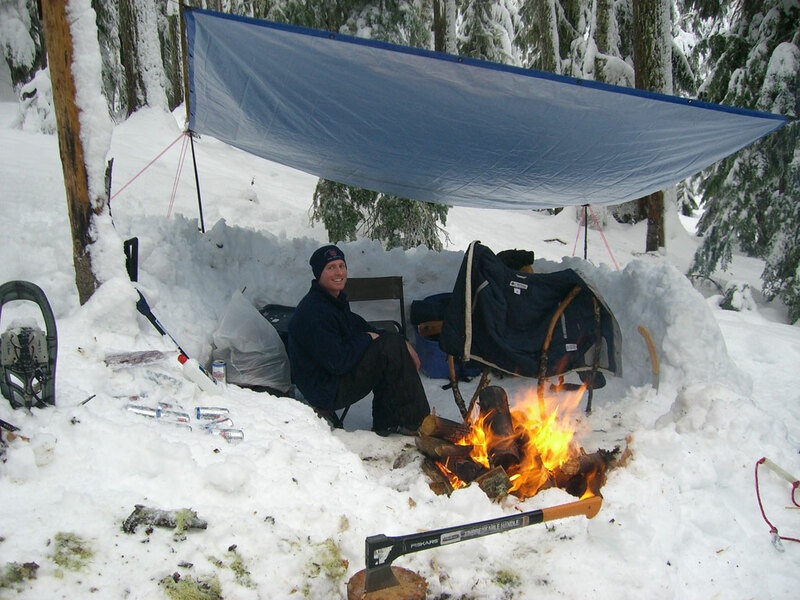 The tropical climate was nice and we had an amazing trip, but I love the snow and mountains of the Pacific Northwest. My friend Tyler and his friend Holli joined Katie and I on a non-technical climb Saturday to Eureka Peak. The route ( 5 mile round-trip) we took begins at the Trillium Lake SnoPark off hwy 26 about 3 miles Southeast of Government Camp. I finally had a free day Sunday with okay weather for a solo climb up Mount Hood to Crater Rock. 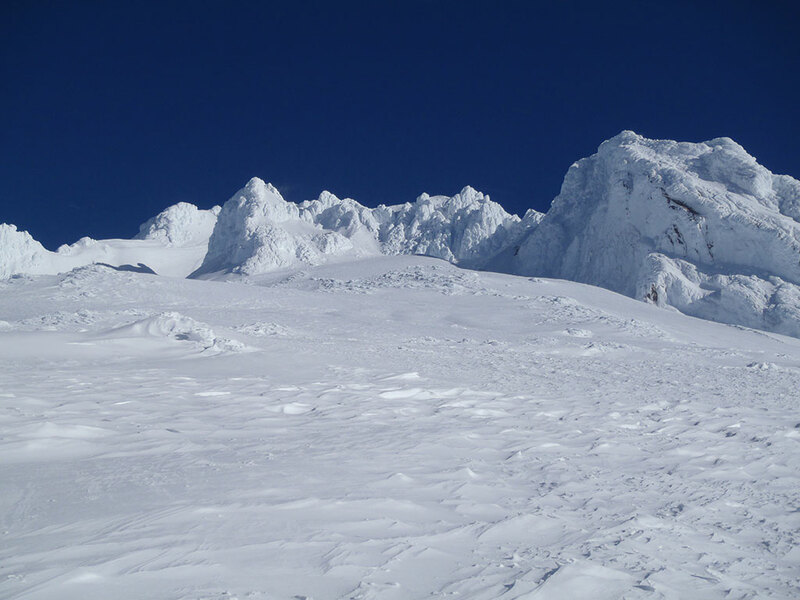 This was my first trip to this elevation on Mount Hood and my plan wasn't to climb all the way to the summit. I am saving that for a future trip. Mount Hood is Oregon's tallest peak at 11,239 feet elevation. It's known as Wy'east to the Multnomah Tribe. 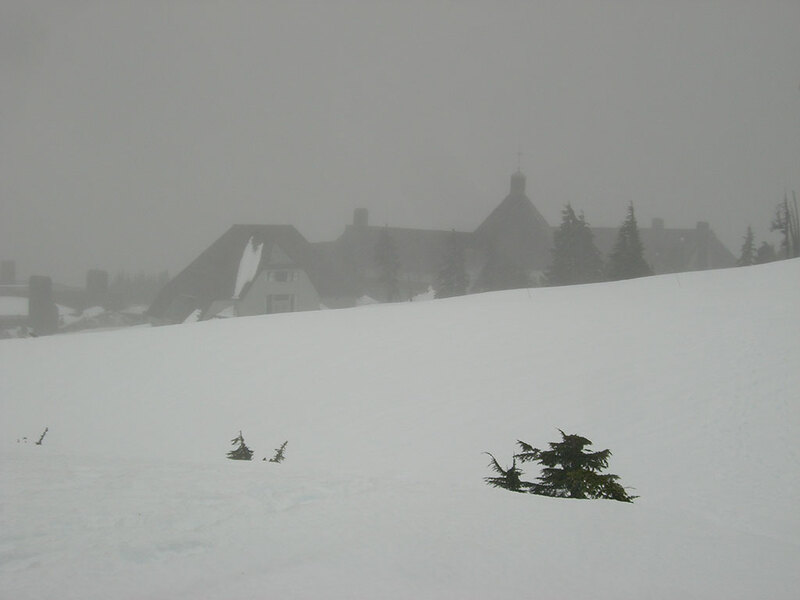 The route I took is known as the South Side Route and starts from the historic Timberline Lodge. 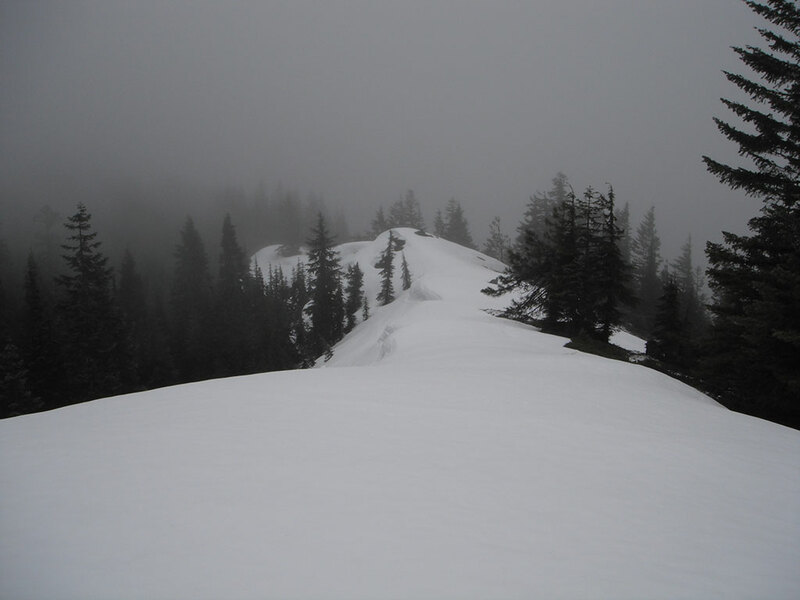 It is about 6 miles to Crater Rock and back with an elevation gain of 4,000 feet. After Katie and I returned from our overnight stay at the Barlow Butte Hut on Saturday morning, we headed out on our next adventure to Ghost Ridge. This is a fairly easy 1.6 mile (each way) trail to snowshoe. The first mile is along the Pacific Crest Trail. After that, the unmarked trail veers to the Southwest (to the right if coming from Barlow Pass SnoPark), away from the PCT. 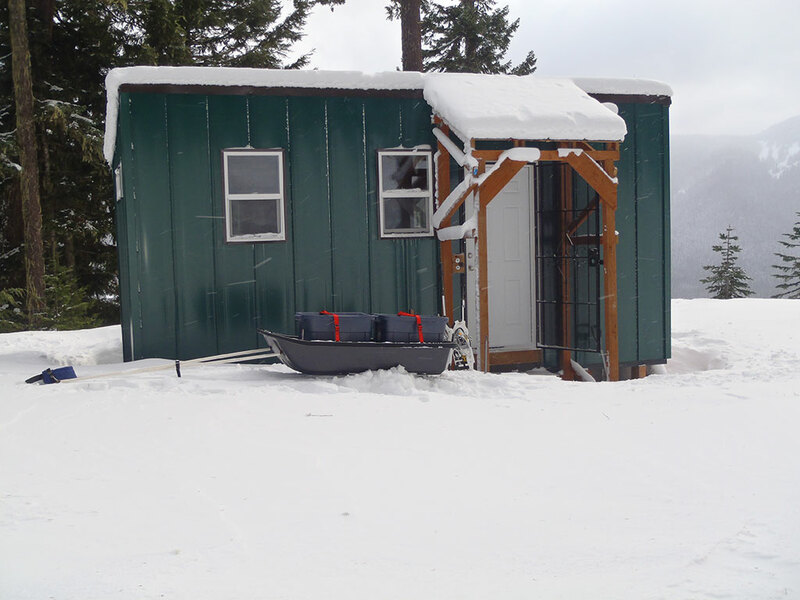 Cascade Huts LLC has three huts for rent in the White River Valley and along Barlow Ridge. We had the opportunity to snowshoe two miles to the Barlow Butte Hut and spend the night Friday. We started at the Barlow Pass SnoPark around 5:15 PM just as the sun was setting. The temperature was about 26° F and there was no wind. One to two feet of fresh snow had blanketed the area during the week. 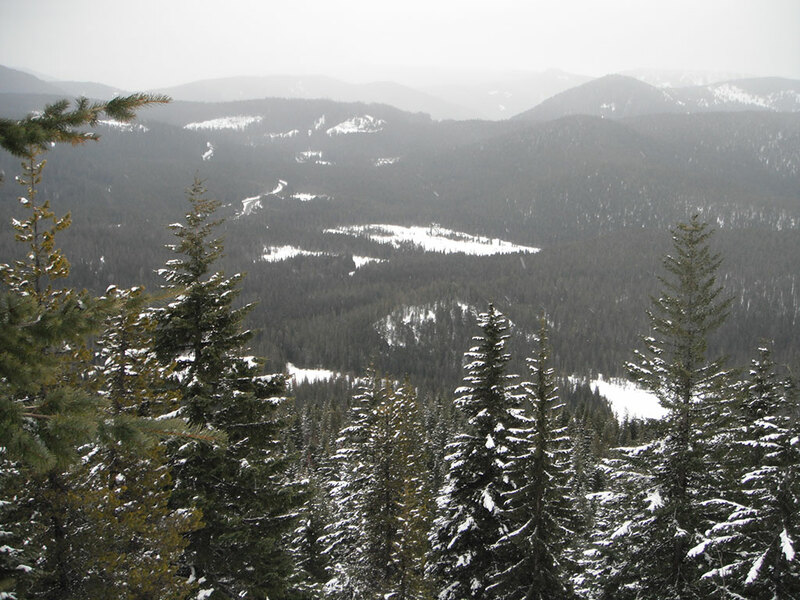 After snowshoeing around Trillium Lake on Sunday, Katie and I decided to hike to the top of Mud Creek Ridge (SE of Trillium Lake). According to my map, the easiest approach is from the North with a gradual climb to the summit at 4,368 feet in elevation. The round-trip climb is less than two miles. After the howling winds and rains last night, this morning was calm and dry. The storm finally brought a little fresh snow to the mountains. 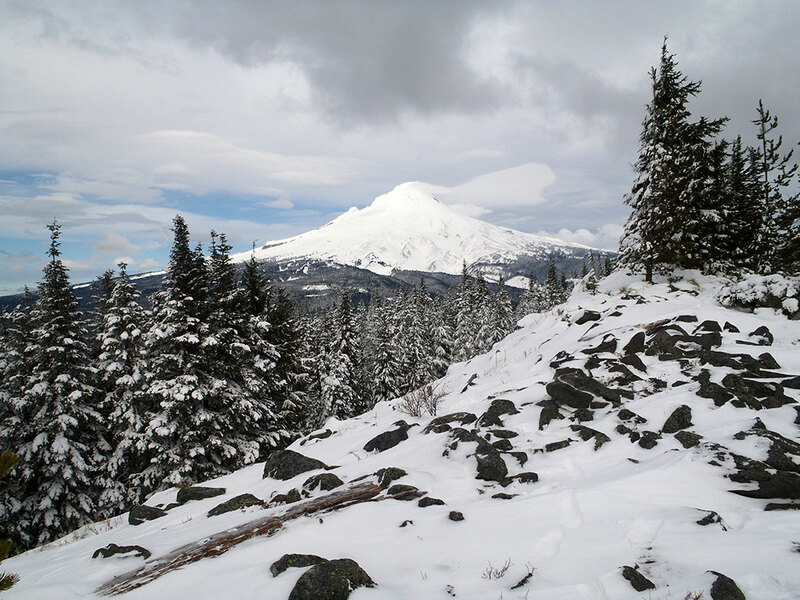 We took advantage of the weather break and headed to Trillium Lake SnoPark for a day of snowshoeing. There were a few other cars in the lot by 8 AM (most left overnight), but it wasn't busy yet. The temperature was just below freezing and rising as the sun was peeking out. 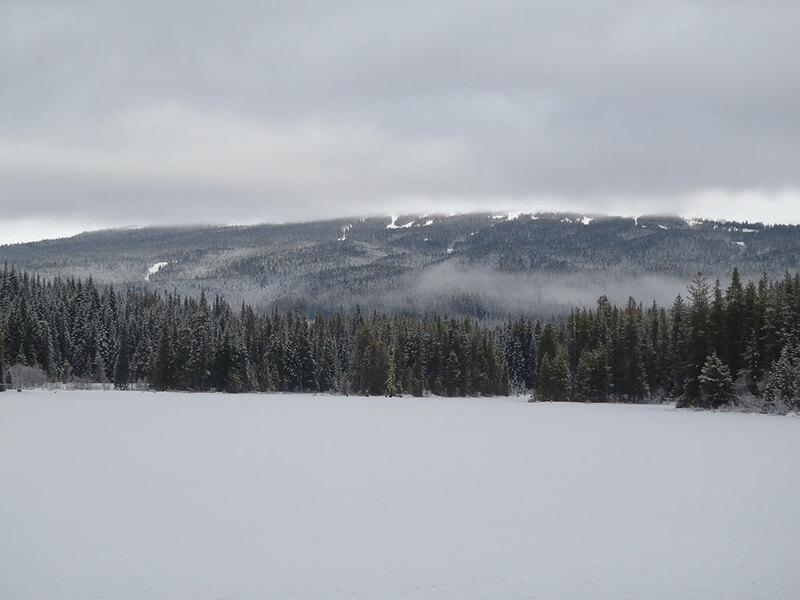 We planned to snowshoe down to Trillium Lake and then loop around the lake before heading back for a total distance of 5 miles. It continues to feels like spring in the middle of winter with warm temperatures and rain in the mountains. On Sunday, Katie and I decided to brave the wet conditions and head to Barlow Pass SnoPark for a full day of snowshoeing. I wanted to try the Barlow Butte Trail #670 and Katie eagerly agreed. If only she knew what she was getting herself into! I failed to mention the trail listed a difficulty rating of "Expert/Strenuous". We left for White River SnoPark (off Hwy 35) before sunrise, hoping to beat the crowds of sledders and other snowshoers. 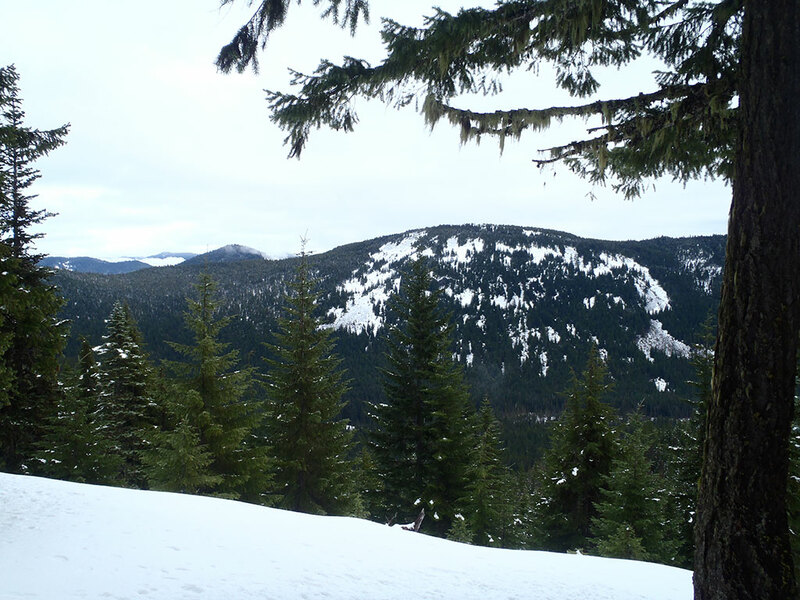 Our plan was to hike up the Boy Scout Ridge trail above White River Canyon on the slopes of Mount Hood. The trail gains about 1,800 feet elevation over 2.5 miles. When we arrived, there were only 9 other vehicles in the parking lot and several had been there overnight. The temperature was about 30°F with a light breeze and low clouds. We were hoping the clouds would clear, so we could catch a glimpse of Mount Hood. 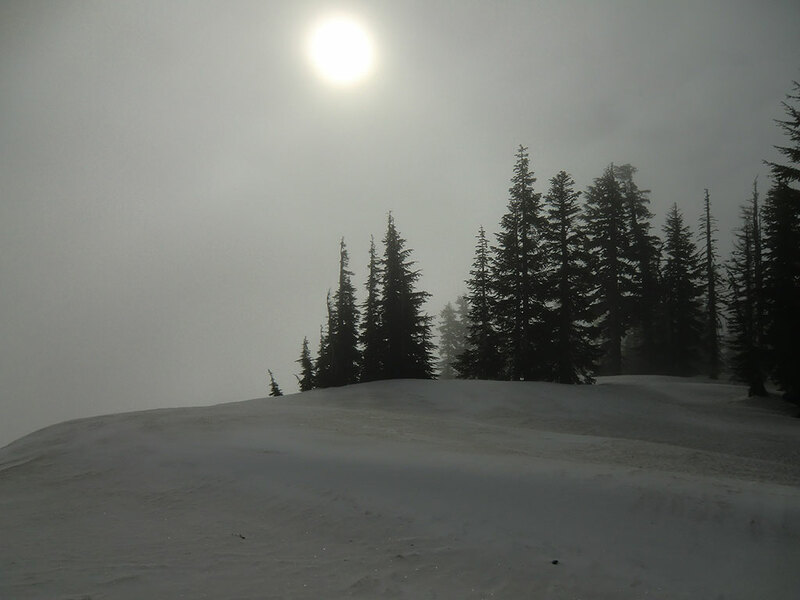 Katie and I had been eager to try out our new Yukon Charlie's snowshoes, so we headed to Timberline Lodge on Mount Hood despite the rainy forecast. At 6,000 feet in elevation, Timberline was the highest place we could drive to. The snow level was predicted to be around 8,000 feet and wind gusts up to 55 mph. Not ideal conditions, but we really wanted to get out in the snow. 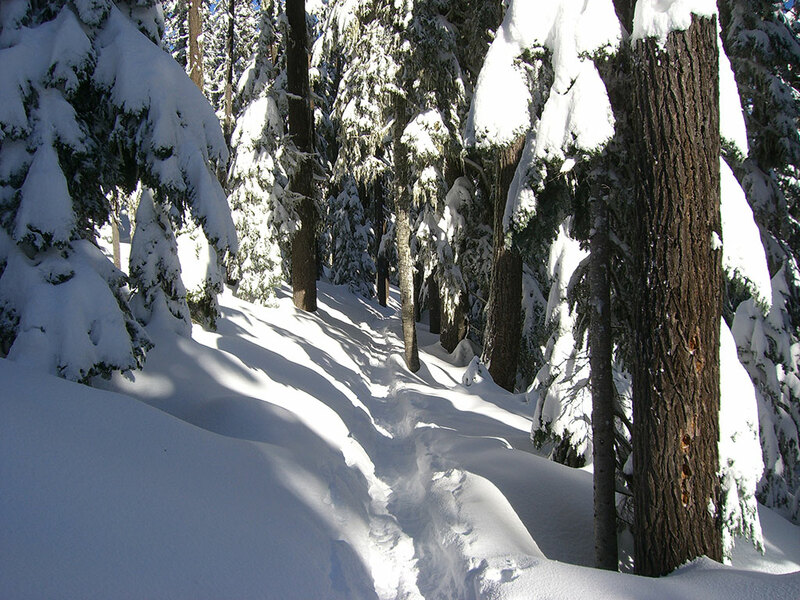 We began snowshoeing a little after 8 AM on Saturday in about 18 inches of snow. Our hike was about 3.5 miles uphill to 3,000 foot elevation near Shellrock Creek in the Upper Clackamas, Oregon. 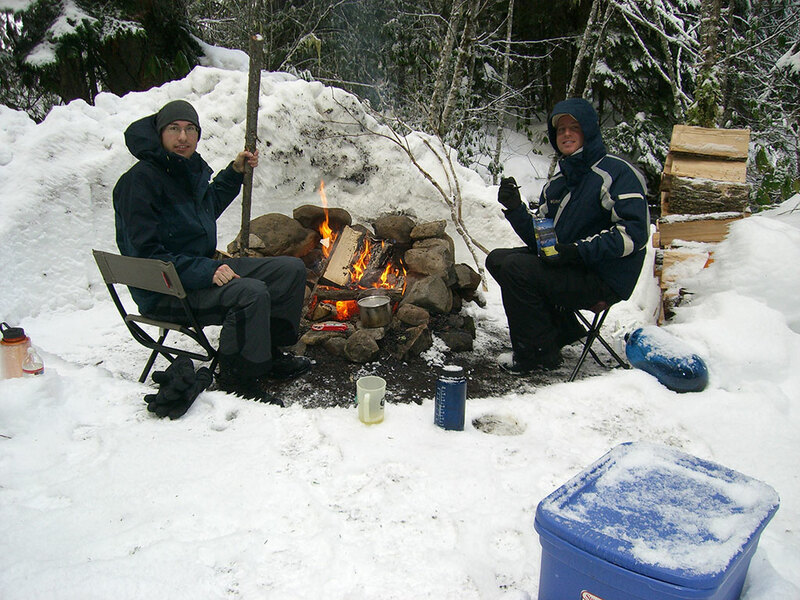 My brother-in-law Scott and I had been looking forward to this snow camping trip for a couple of weeks. The weather was calm with off-and-on snow showers and a temperature around 30°F. We chose this location for the relative solitude. The weather Thursday in the Northern Oregon Cascades can only be described as perfect. The sun was shining, wind absent, and temperature around 20°F. John and I headed to Frog Lake SnoPark (SE of Government Camp on Hwy 26) on what turned out to be one of the busiest days of the year. The traffic was so bad it made the news. After about an hour delay, we finally made it to the SnoPark and set off on snowshoes to Twin Lakes. My Grandpa, Katie, and I snowshoed to Twin Lakes yesterday. Twin Lakes are a pair of hike in lakes near Frog Lake about 8 miles SE of Government Camp, Oregon. Our dog Bella joined us outfitted with her own boots. This was my Grandpa's first time snowshoeing. It was a beautiful day with the temperature right near freezing with cloudy skies. We were the first ones to Frog Lake SnowPark at about 7:30 AM. The hike was about 1.5 miles uphill along the Pacific Crest Trail and then 0.5 mile down to Lower Twin Lake (the bigger of the two). My brother-in-law Scott and I went backpacking near Mt. Hood this weekend. We woke up early Saturday morning and were on the road shortly after 6 AM headed to Frog Lake SnoPark. 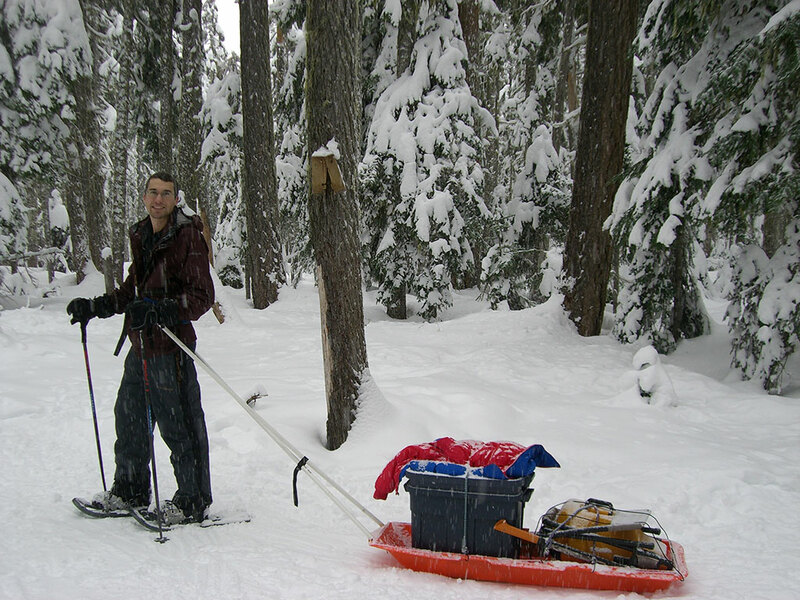 Once we parked and had our gear sleds (Paris Expedition Sled) unloaded from my truck, we strapped our snowshoes on and headed to the Pacific Crest Trail toward Twin Lakes. Our destination was supposed to be Birds Butte, a little over 2 miles uphill overlooking Twin Lakes. Two hours later we had managed to pull our gear sleds about two miles uphill along the trail.